It has been a year since we wrote our Living Life 12 Volts at a Time, and we have some updates to report regarding the production of electricity from our Solar Electric system. The most important change we have incorporated is in the panels we are using. We discovered a 250 watt panel for our 12 volt system made by Grape Solar, and sold by Amazon.com and by Home Depot. Just one of these panels produces as much power as almost 6 of the Harbor Freight 45 watt kits that we first reported as using. 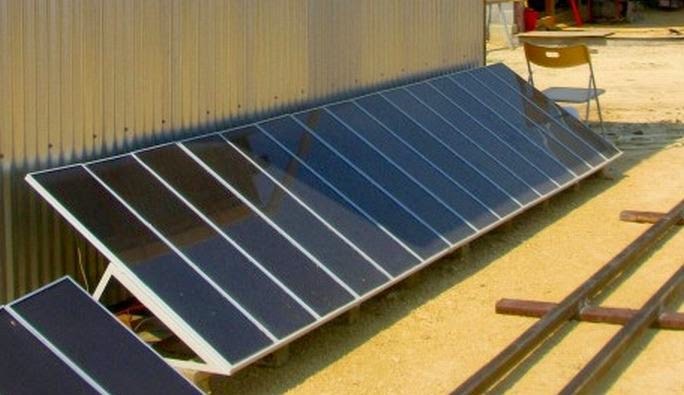 The Harbor Freight kits cost $4.45 per watt, while the Grape Solar panels, costing $375 (Home Depot price) each, cost $1.50 per watt. 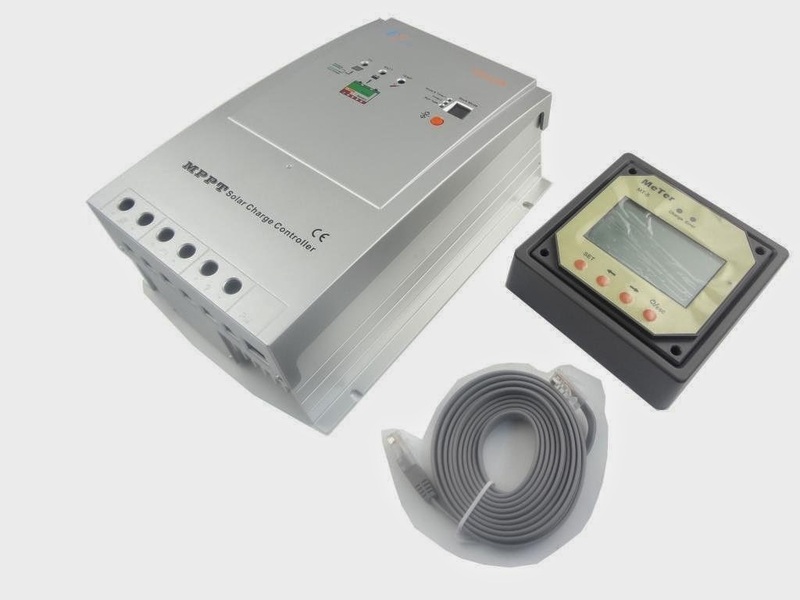 There are two ways that you can connect multiple solar panels into the charge controller, and from there to feed the battery bank: Series or Parallel. In a series connection, the total current produced by the sun is never higher than that produced by a single panel, but the voltages produced by each panel get added together. In a parallel connection the current from each panel gets added together while the voltage stays at about the voltage produced by a single panel. PARALLEL: 3 panels X 5 amps at 13 volts equals (3X5X13) 195 watts. So, you should be asking what's the difference? The difference is that the higher the current, the heavier gauge wire that is needed to carry it. In our series example, we only had to carry a total of 5 amps, but in the parallel example we had to carry 15 amps. Series allows us to use smaller gauge wiring. But there are two down sides to using series wiring. Ever take a two battery flashlight and put one good battery and a dead battery in it? It doesn't work! In a series configuration, every panel has got to be in sunlight before any power is produced. In a parallel design, as soon as even a single panel gets sun, it starts producing, and as more panels get illuminated the more current, and hence power is produced. If you are in an area where the sunlight moves across your panels and shading at times covers some of the panels, then you can't utilize a series configuration. This is where the Grape Solar panels excel. Even a single Grape Solar panel at 39 inches wide can easily get full illumination while 20 feet of Harbor Freight panels spends hours every day with some of the panels in shade at our location. 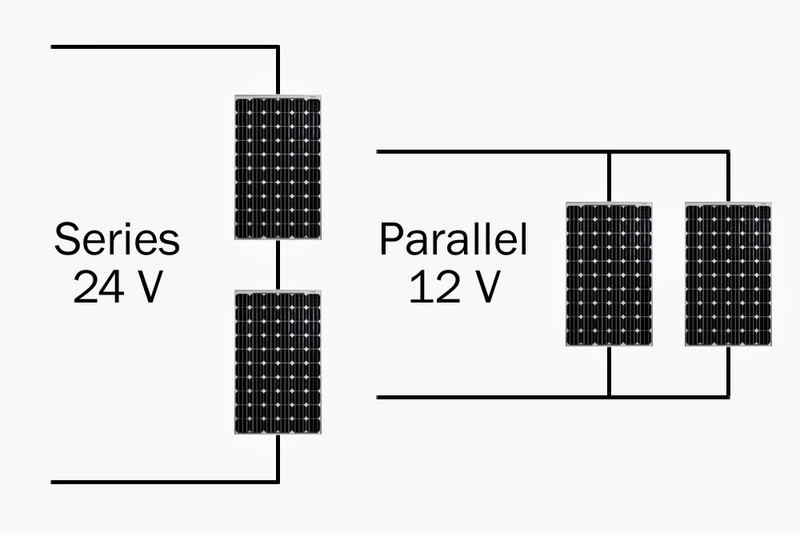 In a parallel configuration, the voltage produced regardless of the number of panels remains at a nominal 12 volts, which is what the battery bank requires. But in a series configuration the voltage increases by each panel's voltage. This requires a different type of Charge Controller. It requires an MPPT (Multi-Point Power Tracking) controller. An MPPT controller can accept higher voltages, and convert extra voltage into current (remember that watts=voltsXamps). It does not magically make power, the power, or watts, remains the same. It just trades off the higher voltage for more current. It does some more wonderful things that you can read about HERE. 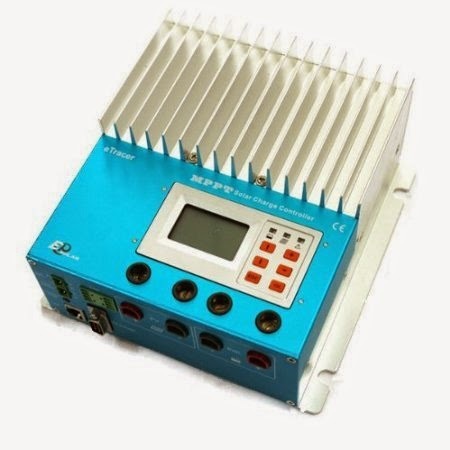 It is important to know that all MPPT controllers have a maximum input voltage and wattage that they can accept. For example, after much research, we have picked two possible controllers for our installation. The one we chose, Tracer (around $300) accepts up to 100 volts and 520 watts input from the solar panels. This only allows us to use a maximum of 2 of the Grape Solar panels. 3 or more panels would overload the charge controller. If we decide to add another Grape Solar panel, then we would have to replace the Tracer we purchased (putting it into safe storage as a back up) and then install our second choice, a RioRand eTracer ($500) which can accept up to 150 volts at up to 800 watts. One consideration with the second choice is protecting the battery bank from over-discharging. Traditionally a charge controller has three functions; charging the battery bank, protecting the battery bank from over charging and damaging the batteries, and protecting the battery bank from over-discharging and damaging the batteries. The less the batteries are discharged each day, the longer their overall life will be. It is generally recognized that a 12 volt battery should not drop below 11.1 volts to prevent damage, so a charge controller will disconnect the batteries from the load at that voltage. But once you get to certain capacity on a charge controller that feature gets removed by the manufactures. That point appears to be at 40 amps, the Tracer we bought is considered to be a 40 amp model and it has this feature, but we found no larger capacity controller that has this feature. Common sense seems to say that if you have a solar electric system that large, you probably no longer have to worry about over-discharge. We leave that decision up to you, but if you want to keep this protection, there is a stand alone device that you can add to your design: Energy Core Products ($60). Charge controllers typically list two other features: PWM and multi-stage charging. These two features are unrelated to MPPT technology. EVERY charge controller needs to have both PWM and multi-stage charging! PWM stands for Pulse Width Modulation and is a technique to better get energy into the batteries. MPPT controllers still use PWM technology. And multi-stage charging, either 3 or 4 stage charging, is still needed on MPPT controllers.The 1st stage is a bulk quick charge, the 2nd is a slower top off, and the 3rd (sometimes 4th) stage is maintaining the charge. We want to warn you that there are some cheap fake MPPT controllers on the market, many imported from foreign markets. If it seems to be too good of a deal to be true, then it probably is. Do some good internet research on any model you are looking at for its reviews. This topic was not in our original post, because a year ago we were using a propane (LP) refrigerator. This is a rather old technology that magically uses heat to make cold. This is all good and well, but required us to refill our 40 pound LP tank every 3 months. Not expensive, but not very self-reliant. It also cools well, but rather inconsistently cooling or freezing the contents depending on the weather. Enter our new solution, which has been one of our most successful projects to date. It all starts with a modern chest freezer. 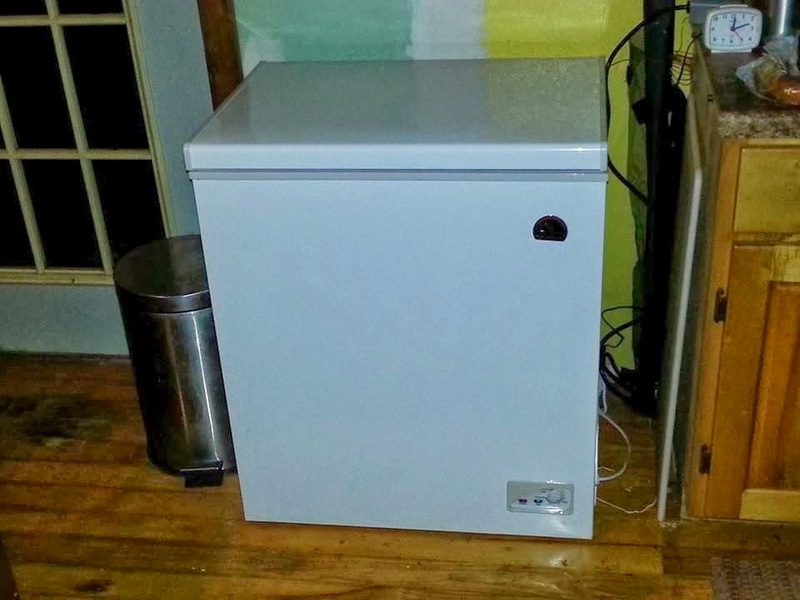 We went with a 5 cubic foot model ($150), an increase from our 2.5 cubic foot LP fridge. Why a chest freezer? A few reasons; it is very well insulated and otherwise efficient, so its use as a fridge will use less energy, and being a chest style you will not dump all the cold air on the floor every time you open it. Remember from science class, cold air falls, so with a standard upright refrigerator every time you open the door the cold air falls on the floor. With a chest style the cold air just sits there in the freezer compartment when you open the lid. But we don't want to freeze our food, we want to refrigerate it. So the next part is a brewers thermostat, used by beer home brewers. This is a purely mechanical device that consists of a sensor on a long wire, a dial to set the desired temperature, and a power cord that turns the chest freezer on and off. This device allows us to ignore the freezer's built in 'freezing temperatures only' thermostat and instead externally monitor and hold refrigerator temperatures. We chose the Johnson Controls model ($58). Now the astute reader of this blog may have realized that this project contradicts our 'Living Life 12 Volts at a Time' statement. And you would be correct. This is our sole 120 volt AC appliance. So now we need a way to make 120 volts of AC. This is done by what is known as an inverter. There are two main types; the cheap square wave type and the expensive true sine wave type. For many appliances one is as good as another. But for any appliance with a motor, such as a refrigerator, you really need a true sine wave model. One more requirement: The refrigerator will only be running (hopefully) a few minutes every hour or so. We really don't want the inverter running 24 hours a day for this. So we wanted a model that would turn itself off whenever it wasn't needed, and when it was needed (when the fridge needed to run) would turn itself back on; auto load sense. We chose the Xantrek Prosine 1000 (About $300 used on eBay, $650 new). Go back to the picture of the chest freezer above, and look in the upper right corner (clicking on the picture will give a larger view). Did you notice the small electric clock? We got a cheap, non-battery backup clock and plugged it into the brewers thermostat along with the chest freezer. This means that whenever the freezer was running, so was the clock. We set the clock at midnight, and checked back 24 hours later. The clock had run for 1.5 hours. When the freezer is running, it is pulling 14 amps from our battery bank. Since it does this for 1.5 hours per day, this means that the entire setup is only using 21 amp hours a day (1.5 x 14=21)! It only takes about 1 hour of sunlight a day on our solar panels to supply enough power to run the fridge for the entire day! You might be thinking this project is adding up: $150 + $58 + $300 = $508. A new upright refrigerator starts around $600, and a 12 volt DC model designed for solar electric will run $1,000 up to $2,800. Summer is back, but that's not really what got us to thinking about this addition. Last winter got rather cold. We found ourselves sitting and wondering where all the heat from the wood burner was going... Then we stood up and found the answer, it was all up at the ceiling (back to science class, remember warm air rises). That's what got us thinking about a ceiling fan, which would stir the air. Not that we would mind its cooling power right now in the summer. Our house came with a whole house attic fan, which while working great, can only be run off of our gasoline generator, even our new true sine wave inverter can't run this monster. So what might exist in ceiling fans that could efficiently run on our solar power system? Found the answer! A company called Sun Shine Works sells 3 and 4 blade 60 inch 12 volt ceiling fans ($316 with variable speed controller) that are incredibly efficient (note that at higher speeds the 3 blade is more efficient than the 4 blade). At 12 volts the 3 blade moves almost 1,500 cubic feet of air per minute while only using 0.5 amps! That is the same amount of power as just one of our LED room lights! There is an optional reversible variable speed controller (we included its price above) that we strongly recommend. First, it gives you the ability to reverse the fan for winter time use, and second it contains a voltage inverter that converts your 12 volts into a range between 9 volts and 27 volts to run the fan at slower or higher speeds. By the way, the fan should blow down in the summer and up in the winter. Well, that covers it for the changes, upgrades, and additions that we have made in the past few months. Any questions or comments, feel free to post them here on the blog!